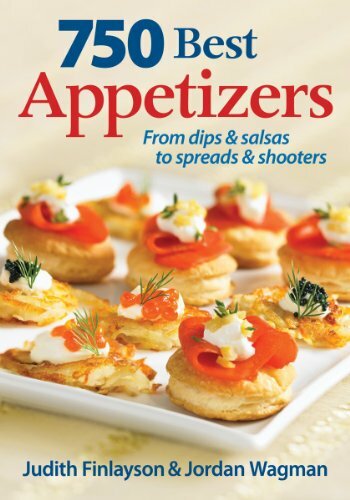 From dips to tarts to seafood, sandwiches, and desserts—name your poison—although probably not the right word to use when discussing recipes—the point is that this book offers up every taste to satisfy your guests, whether entertaining a large group or an intimate party of close friends. A personal favorite is the section on Shooters, defined as “. . . robustly flavored soup-like drinks that are powerful mouthfuls of flavor. Usually present in small portions each, they get any gathering off to a lively start.” Indeed, with titles like Cumin Mint Cooler, Sangrita, Almond Gazpacho with Green Grapes, Thandai, and Black Bean and Feta Shooter, what gathering would not start off with a Greek shout-out: Opa! For a more substantial appetizer, the Panini, Sandwiches and Tartines section overflows with mouthwatering offerings. The Mini Muffulettas—a famous New Orleans sandwich of cold cuts topped with an olive salad spread and served on a baguette will not sit for long on the table. The Elena Ruz Cubano is especially intriguing with its mixture of tastes including strawberry jam, smoked turkey, cream cheese, and pickled hot banana peppers. Looking for a little excitement with your food? The section on Sticks and Picks will appeal to the outdoorsperson. This chapter pronounces food on a stick to be both exciting and romantic. Place a platter of Tomato and Cheese Skewers, Caramel-Glazed Sweet Potato Skewers, Fruit Skewers, or Shrimp Kabobs in front of a hungry group and get out of the way. You probably won’t have to wash the platter. Side dishes are discussed in Tarts, Dumplings, and Crepes. Bring out a dish overflowing with a Goat Cheese and Caramelized Onion Vol-au-Vent or a Butternut Galette with Basil Drizzle or Oregano and Cheese Bundles, and get ready for the stampede. This discussion would hardly be complete without a few words about Desserts. If you are a choc-o-holic, you will not want to miss this section as you prepare for your guests. But don’t skip the chapter if you don’t happen to like chocolate—give a look at the Frozen Pecan and Caramel Log or the Raspberry Puff Pastry Fingers. Chocolate, fruits, and nuts are amply sprinkled throughout the dessert recipes, but as with all the recipes in this book, there is an exceptional opportunity to experiment with herbs and spices, creating special tastes that will be remembered long after the food is gone and the party is over. This section takes you through fruits, cakes, puddings, and pastries and does not leave you wanting. There is hardly enough room to talk about the wonderful recipes presented by Ms. Finlayson and Chef Wagman, but it should be noted that there is more to this book than just delicious recipes. The authors provide tips for substitutions, vegan and vegetarian friendly accents, and hints for treating leftovers. Their presentation is clear, the recipes are easy to follow, and the photographs of many of the offerings stir hunger pangs from deep inside. The world is well represented with recipes that originate from many ports of call including Scandinavia, England, Cuba, Italy, Asia, and throughout the Middle East as well as throughout America, leaving the cook with a sense of travel without ever leaving the kitchen. It’s difficult to do justice to the 750 recipes and the overall presentation, except to say that this book never goes on the shelf—it never leaves the countertop, where it is always within easy reach, 24/7.